Nope, it's not standing anymore. Sidonienstrasse is just east of the Hauptbahnhof - no chance a villa could have survived the bombing there. You would be surprised how many famous musicians, composers, actors, writers ... artists have lived in Dresden for a while. 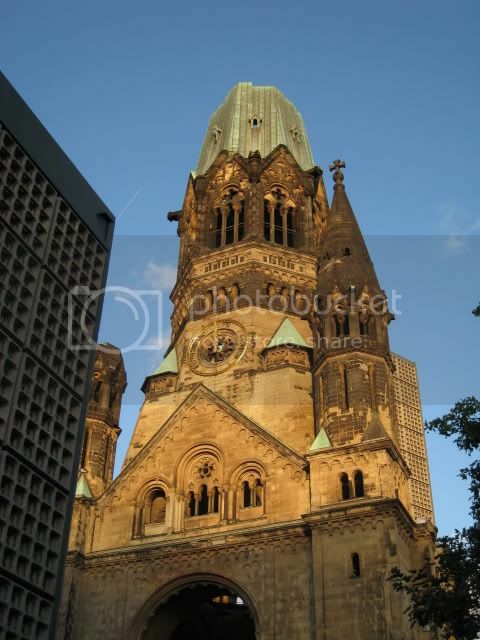 Many of them Russians (thus the Russian-Orthodox church south of the Hauptbahnhof which *did* survive the bombing). Related music news: It was announced yesterday that Christian Thielemann signed a contract to become Chief Conductor of the Staatskapelle Dresden from 2012 on. YAY! He's probably the best Wagner/Strauss/Bruckner conductor alive. I'm another who just falls more in love with the city every time I go (two times so far). The first time, Ingo took me on a wonderful walk down the Elbe and its villas to see the wonderful Blue Wonder Bridge. The second time, despite a pocketfull of plans, I just flit from cafe to cafe enjoying the sunshine and food and people-watching. I think it just gets under one's skin -- or not. I hope to go back pretty soon and maybe get to all the cultural events. 2012 . . . hmm. . .
What a wonderful trip report, yk. You always make me want to pack and go! A Day on the Museumsinsel, and our first wurst finally! 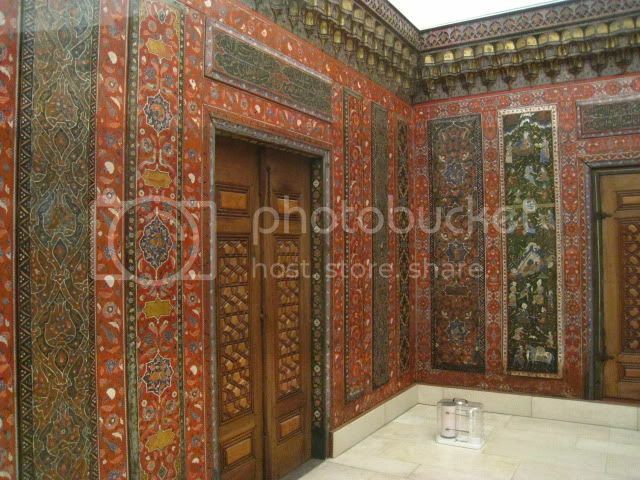 When we were in Berlin, only 4 museums on museumsinsel were open (Pergamon, Bode, Altes, Alte Nationagalerie). The 5th one (Neues) will reopen soon this month. 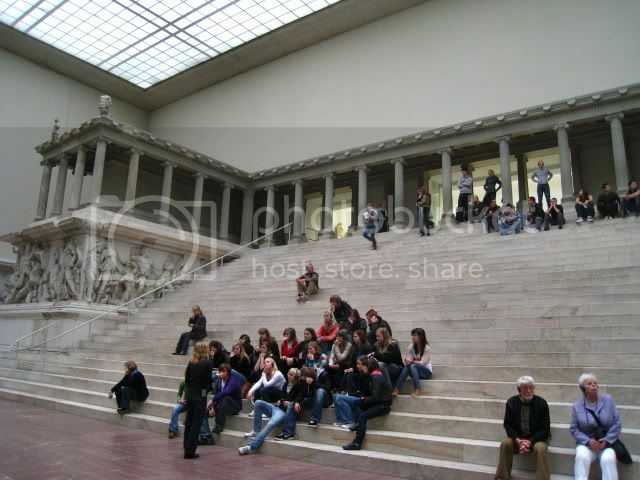 We began at Pergamon Museum, which is where be bought our 3-day Museum Pass. One thing I really like about the Berlin museums, is that audioguide is always included with admission fee. 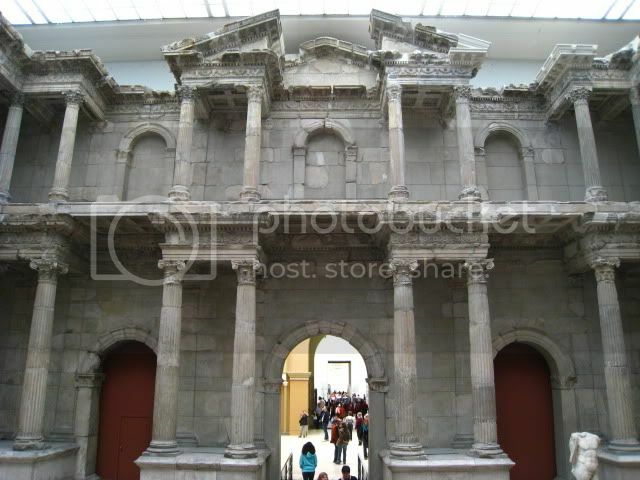 The next big item is the Market Gate of Miletus. http://i406.photobucket.com/albums/p...9/IMG_4533.jpg After you walk through the Gate, here comes my favorite: the Ishtar Gate and Processional Way. I love the blue-glazed tiles and the animals that adorn the walls. We spent less time in the Hellinistic section (we’re not into Greek & Roman sculptures). Altogether, we were at Pergamon Museum for 2 hours. It’s now lunch time. 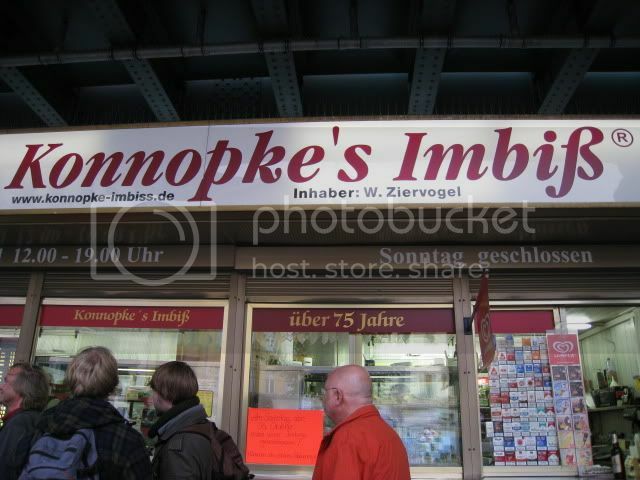 While we could eat a museum café, we decided to get our currywurst from the famous Konnope’s Imbiss @ the Eberswalder Strasse station. http://www.konnopke-imbiss.de/ Tram M1 conveniently runs between Am Kupfergraben (2-min walk from Pergamon Museum) and Eberswalder Strasse station. The ride is 20 minutes and we welcome this break from the museums. We each ordered the currywurst with fries, plus a beer. It does taste very good, but is it really the best? That I don’t know as I don’t have others to compare with! To top off this greasy meal, we each had a Magnum Classic for dessert, as if we didn’t ingest enough fat already! It was windy and cold, but that didn’t deter us from having ice-cream! We rode Tram M1 back to Museumsinsel, and our next museum is Bode Museum, which houses European sculptures. 2) Entire room of works by Tilman Riemenschneider. I find his sculptures very moving. 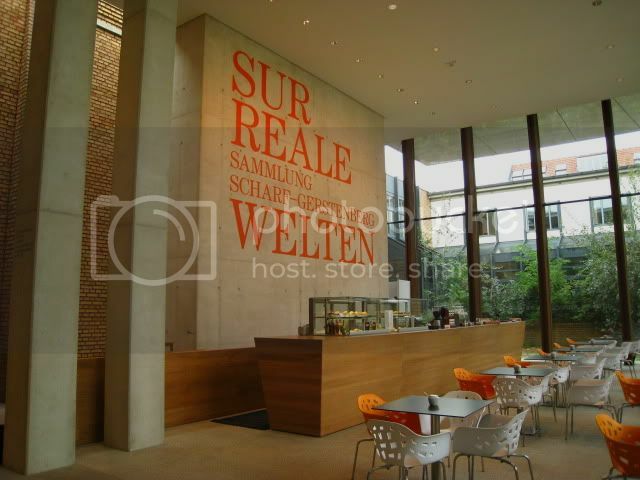 We were already ready for another break, so we visited the new cafe on the 2nd floor at the Bode Museum. It is a nice, airy and open space. We recharged ourselves with 2 coffees. Altes Museum holds mostly Greek and Roman works of art. Again, we're not into those much. We did stop and enjoy quite a few Greek amphoras; but our main goal was to see Nefertiti, which is temporarily there until her move into Neues Museum. Well, sadly, Nefertiti was NOT on view. We asked one of the guards, and my understanding is that she is "resting" before the big move later this month. I've seen Nefertiti before, but I was looking forward to seeing it again. Our last museum for today. 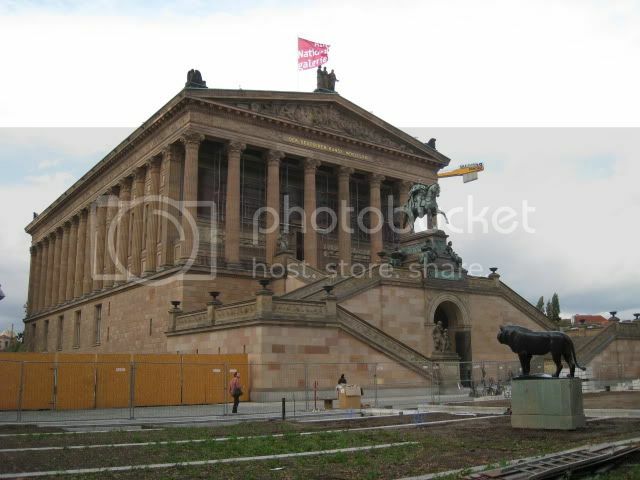 Alte Nationalgalerie houses paintings - mostly by German romantic artists, and some French Impressionists. I was interested in seeing paintings by Casper David Friedrich, esp after Pegontheroad had mentioned those on her TR. Another disappointment! The entire 3rd floor of the museum was closed to the installation of an upcoming exhibition of Carl Gustav Carus (mentioned by Ingo here: http://www.fodors.com/community/euro...omment-5894396 ). As a result, only 4 Friedrich paintings were on view; of the 4, I like The Abbey in the Oakwood the best. We also went to the French Impressionists galleries before we left. It's only around 5pm and it's still light out. With our 7-day transport pass, we decided to hop on a city bus to head to West Berlin. DH has read/heard about Ku'damm a lot and wanted to see it, even after I told him it's nothing more than a shopping street. There is also displays in English detailing the history of the church. We headed straight up to the Gourmet food floor. We were thinking of picking up some food to bring back to our apt as dinner. But then, we went one more floor up to the top floor wintergarten where the Buffet is http://www.kadewe.de/en/shops-stops/...ants/lebuffet/ and we decided it's easier to just eat dinner there. I ate here in 2003 with my parents, and didn't think prices were too outrageous. Perhaps this is now under a new managament, because it IS expensive. Hot main dishes for dinner are 15 euro. We opted for the cold buffet bar (charged by weight), thinking that it may be cheaper. But our bill ended up being 36 euro, and we didn't get that much food! One "problem" I noticed is that the plate is being weighed and charged as well. The cashiers don't seem to cancel out the weight of the glass plate; which easily weighs 100 or 200 grams. Our plate of antipasto (half a dozen marinated mushrooms, 4 stuffed grape leaves) cost 12 euro. We should have stuck with hot main courses instead. But the space is really quite nice. I bought an Ampelmann Sigg water bottle http://ampelmannshop.com/product_inf...roducts_id=709 which I've been using daily ever since I've bought it! Ingo, will you miss Fabio Luisi? He'll be guest conducting the Boston symphony Orchestra next month. Is Gate of Miletus finally off its scaffolding? That's great. Thanks. Have never seen it without scaffolding before. 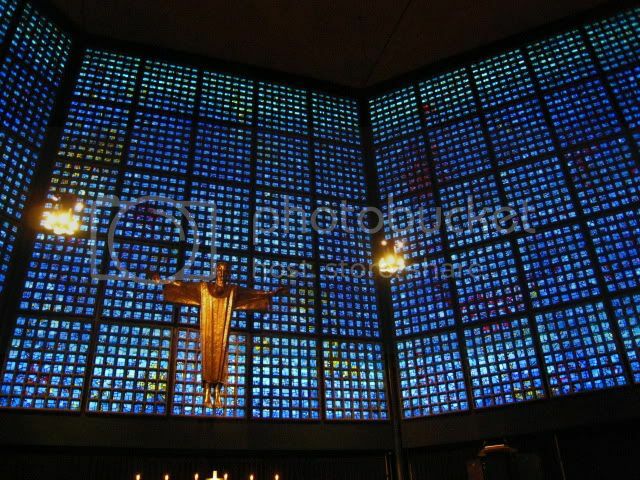 "While I don't like the exterior of the new church, the mid-night blue stained glass viewed from the inside evokes a sense of peace:"
The exterior was so unattractive, I did not even want to go in. A few days later I did - found the interior strangely beautiful . Another terrific report, yk! I always love the way you incorporate photos into your writing. 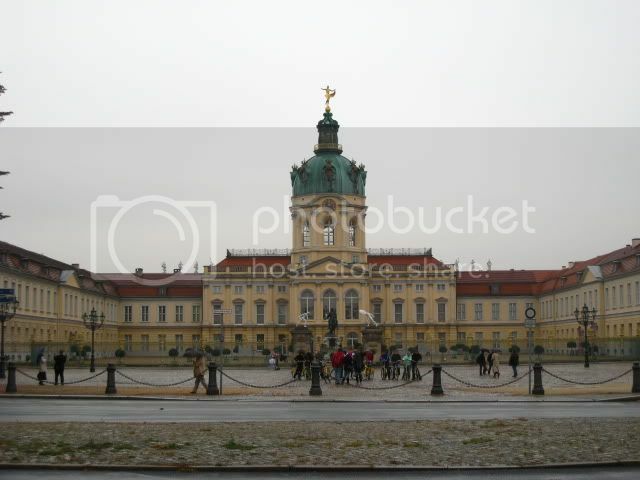 We're in the planning stages of a return trip to Berlin and Dresden, the last one being several years ago. As we prefer to stay put for a week or so at a time, I'm intrigued by your Berlin apartment, so I'll be checking it out further. Excellent new installment, yk! 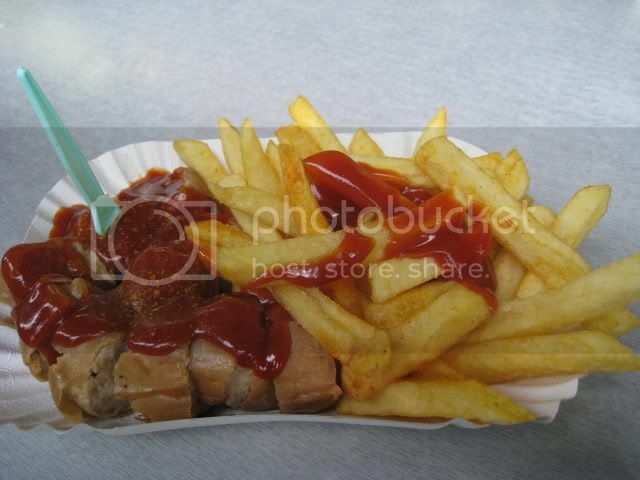 I personally don't care for Currywurst, but to each their own ... and if you're in Berlin you have to try it once. Wow, still a load of museums ... I think I'd been extremely tired that evening. 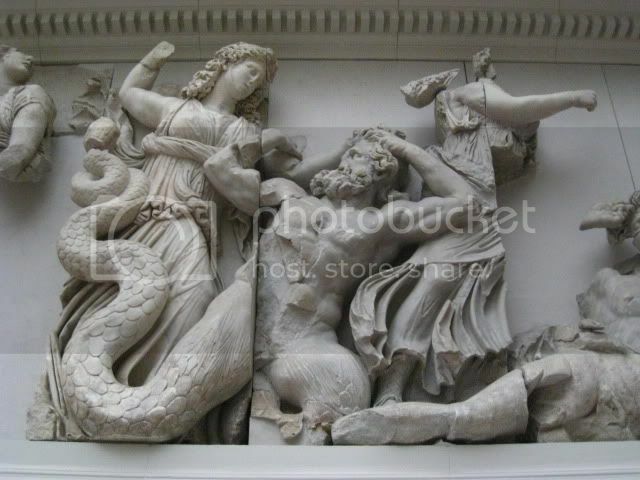 I love the Pergamon Museum, been there a couple of times before the wall came down. Sorry about the Caspar David Friedrich paintings. But you said you'll come back one day, eh? When the Albertinum iin Dresden opens you'll get to see a stunning collection of his (and his fellows' like Carus, Dahl etc.) paintings. Luisi excelled in some Italian operas like Don Carlo, Rigoletto. On the other hand he has NO business in Wagner (awful Meistersinger and Ring) and Strauss (Alpine Symphony) except for Hero's Life which was awesome on tour in New York as a friend told me. No, I won't miss him. 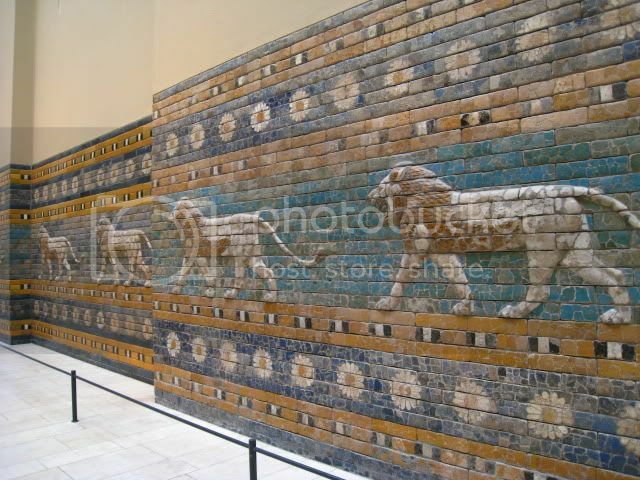 The Ishtar Gate is beautiful- I love the indigo tiles. There is a sma bit of it at the ROM in Toronto- one animal's worth, if I remember correctly. I was lucky to see more of it at the Babylon exhibition at the Louvre last year. The museums in Berlin sound so good I think I'd like to set up camp in one of them. swisshiker, if you have more specific Qs about the Berlin apt, don't hesitate to ask. I was looking at Apt 1's availability caledar, and it appears to be quiet popular. CarolJean, I should have gotten an Ampelmann sponge too. But I probably wouldn't want to use it. Apres, more museums to come in the next 2 days! Old Masters Paintings; Modern Architecture; and more wursts! In the morning, we went grocery shopping again, this time in the Schonhauser Allee shopping arcade. We picked up 4 weisswurst from the butcher shop (2,75 euros for 4), milk from the basement supermarket, and baked goods from the bakery. We also picked up veggies and noodles from the Asian market on our street. I was in heaven. Period. I visited the Gemäldegalerie in 2003, but at that time, I was still rather ignorant of art & paintings. That's why this is a must-see for me on this trip. It has a huge collection of Flemish Primitives, one of my favorite time period. van Eyck, Memling, van der Weyden; just to name a few. And of course the famous Bruegel painting: Netherlandish Proverbs. Too bad the display next to the painting only has the proverbs listed in German but not in English; otherwise I could have easily spent an hour just looking at each proverb! It also has many Lucas Cranach, Holbein, and Durer paintings. What else? A room full of Rembrandts, a stunning Caravaggio. We ate lunch at the 1st floor cafe of the Kulturforum. The food is quite nice, though the setting isn't as nice as some other museum cafes. I had a bratwurst plate (bratwurst with 2 sides: potato salad and green salad). DH had a pasta special of ravioli with pesto. Lunch was 16 euro. 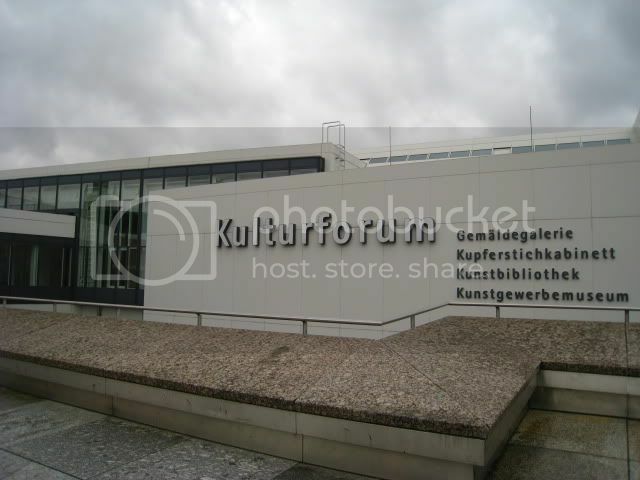 At the other end of Kulturforum sits the museum of Decorative Arts. 4 floors of galleries display items chronologically from Medieval times to modern times. Based on our interests, we only visited 2 floors. The top floor houses Art Nouveau and Art Deco objects. I thought it was slightly disappointing, as there are few Art Nouveau but plenty of Art Deco. The basement houses modern designs, including Eames chairs, Barcelona chairs, furniture by Marcel Breuer. We were met with disappointment! The entire building is devoted to 2 special exhibitions; so no permanent collection is on view currently. We couldn't enter the special exhibits with our MuseumPass. Since we don't know anything about the 2 exhibitions, we moved on. 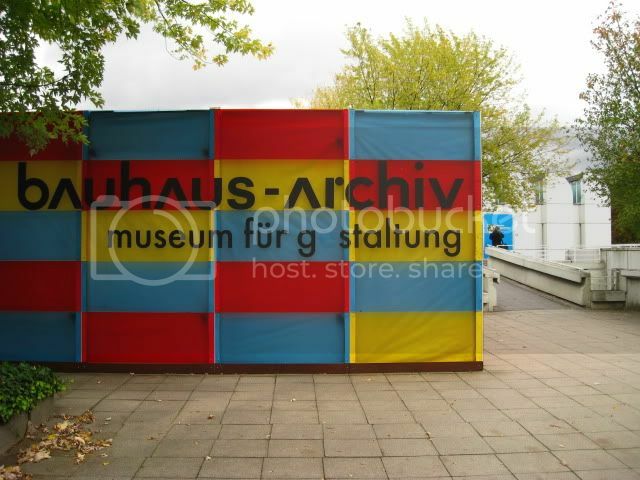 Because of the huge Bauhuas exhibition at the Martin-Gropius-Bau, the Bauhaus-Archiv was empty during that show. 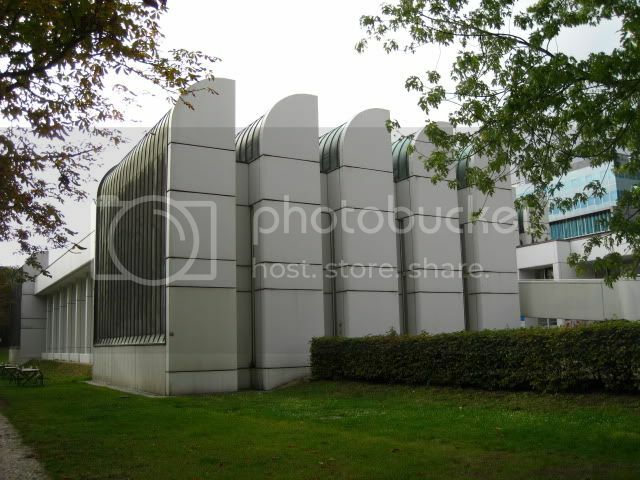 As a result, the Bauhaus-Archiv decided to put on an architecture "exhibit" of the building itself; taking advantage of its emptiness to showcase Walter Gropius' design. The "exhibit" is a 25-minute self-guided audio tour of the building. 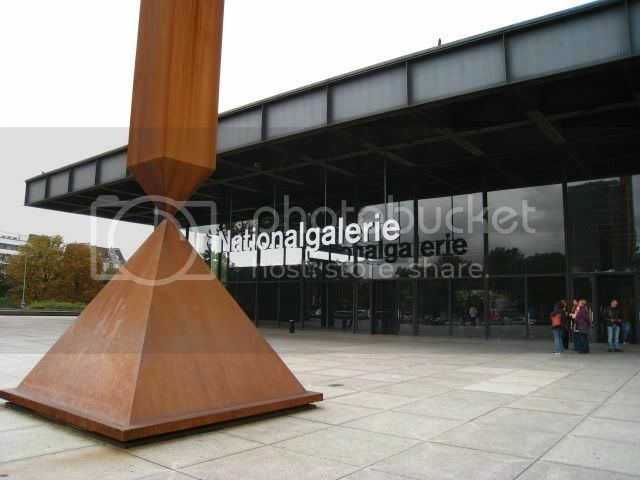 There are a total of 8 stops, starting at the main exhibition hall inside the building, then heading outside to the entrance courtyard, then to the S side along the canal, then the West facade; and eventually back to the main entrance on the Eastern end. We really enjoyed this tour. 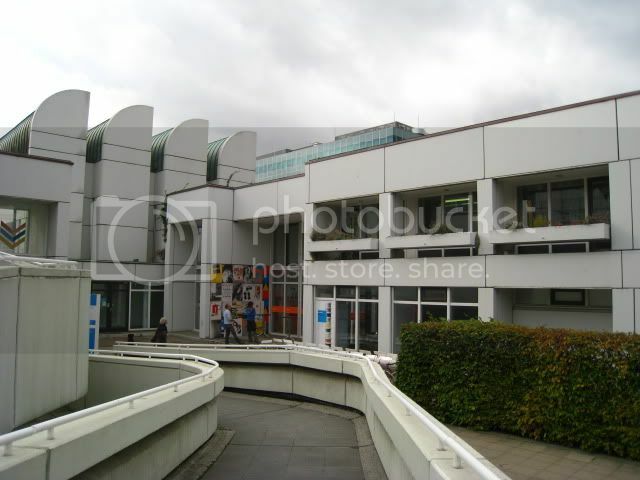 Gropius initially designed this building for a different location; but it was finally settled in its current location after his death. Therefore, his plan and design had to be altered in order to fit into this plot. I had thought this museum is all about the Holocaust, and it isn't. 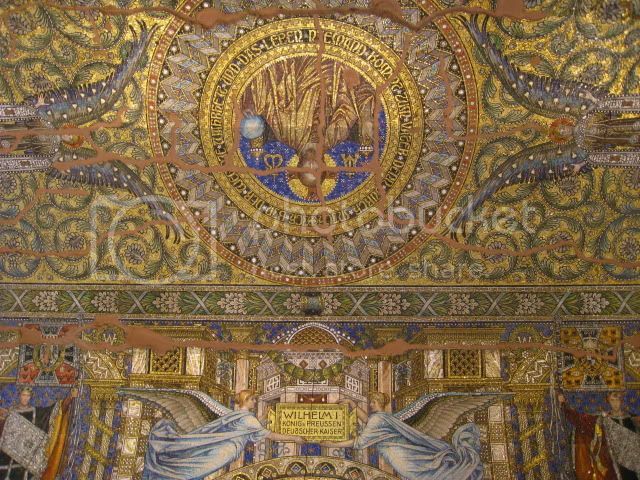 It is more of a chronological display of Judaism in Germany and later Berlin throughout the ages. I thought it was well done and I learned a lot about the Jewish culture. Of course, the Holocaust is still featured, but it's not overwhelmingly dominant. We could have spent hours there, as there are lots of interactive (audio, video) displays. This is one of those "void" spaces within the building; but the ground is covered with over 10,000 open-mouthed faces made in iron. The guard told us that we could walk on top of these iron faces across the void. DH did so. The noise and echo he made (in this otherwise silent space) was creepy. The bare concrete tower is 24 meters high and neither heated nor insulated. It is lit by a single narrow slit high above the ground. When we went inside the tower, it was dark already. Once we went through the thick heavy doors, I was in complete darkness, except for very very dim light coming through that slit. It was cold, impersonal, and scary. I couldn't see my fingers held in front of me. It gave me a taste of what a concentration camp prisoner must have felt - helplessness and hopelessness. I couldn't wait to get out of there. 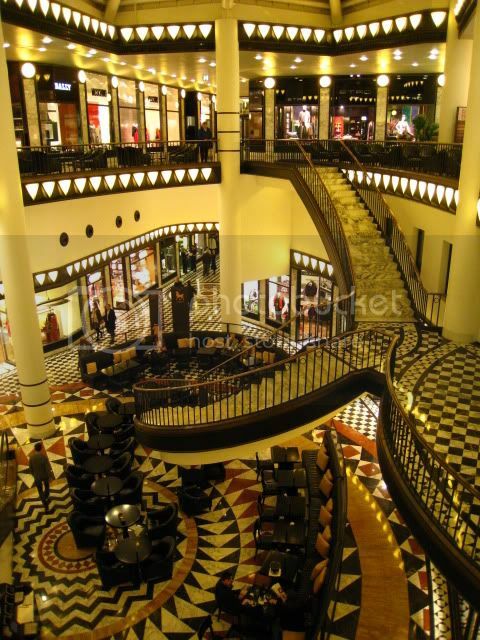 Quartier 207 is home of the Galeries Lafayette. 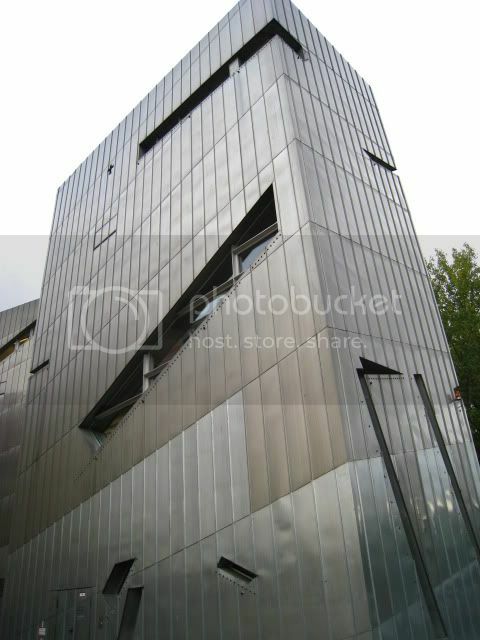 http://www.galerieslafayette.de/ The building is designed by Jean Nouvel. We looked at the giant glass funnel in the middle of that store. The gourmet food level in the basement was rather small actually. We pan-fried the weisswursts for dinner back at the apartment. They were delicious. I also made veggies noodle soup. We ended our dinner with a slice of cheesecake bought from the bakery this morning. This lovely dinner cost about 7 euro. I was in complete darkness, except for very very dim light coming through that slit. It was cold, impersonal, and scary. I couldn't see my fingers held in front of me. It gave me a taste of what a concentration camp prisoner must have felt - helplessness and hopelessness. I couldn't wait to get out of there." I was there on a sunny summer day but felt the same way. I have never imagined an empty space could be so moving. Some people came out weeping. danon, off-topic completely, may I ask which Habitat Apt in Barcelona you stayed in last year? I saw you referred to that company in several threads, but I didn't see which particular apt you rented. I may need further apt location assistance from you as you seem to be very familiar with Barcelona. Today is our last full day in Berlin; as well as Day 3 of our 3-day MuseumPass. I really like Art Nouveau, so I enjoyed this small-ish museum a lot. Ground floor exhibits both Art Nouveau and Art Deco objects (ceramics, glass vases) plus furniture. I'm not too familiar with Art Nouveau artists names, but at least one set of furniture there was designed by Guimard. First floor mainly shows Art Nouveau silverware - dinnerware and coffee/tea services - from different European countries. So one can compare and contrast AN styles of say, Great Britain vs Denmark, or Austrian vs Belgian. The other half of first floor is the paintings gallery. The top floor is closed for an installation of a new exhibition. Per the website, On the 3d floor a cabinet is dedicated to the Belgian Art Nouveau artist Henry van de Velde and another to the Vienna Secession artist Josef Hoffmann. Sadly, I wasn't able to see any of this. Located right next door to Bröhan Museum is Museum Berggruen. Its main collection is works by Matisse, Picasso, and Klee. The building is circular, so one follows a circular route through the galleries, which hangs the works (mostly) chronologically. Ground floor begins several galleries with Matisse. The last room or 2 is Picasso earlier years (1900-1910). 1st floor is completely dedicated to Picasso. Since it doesn't have an overwhelming collection, I find it perfect to get a taste of various styles & stages of Picasso throughout his life. We went from his Blue Period to Cubism, then Guernica/WWII period. There were also many portraits of Dora Maar in different renditions. The last paintings by Picasso there are from 1960s. I am not a huge fan of Picasso, but mostly because of his long career and his HUGE oeuvre. Every time I go to an exhibition of his, I get exhausted by the overwhelming number of works. Therefore, I really liked this Picasso collection at Berggruen. It covers 60 years of Picasso's career in a manageable fashion. 2nd floor has one room of Giacometti's sculptures. The rest of the galleries filled with works by Paul Klee. This is another artist I'd like to know more about. However, because of time-constraints, we didn't have time to listen to the audioguide. Next time, maybe. 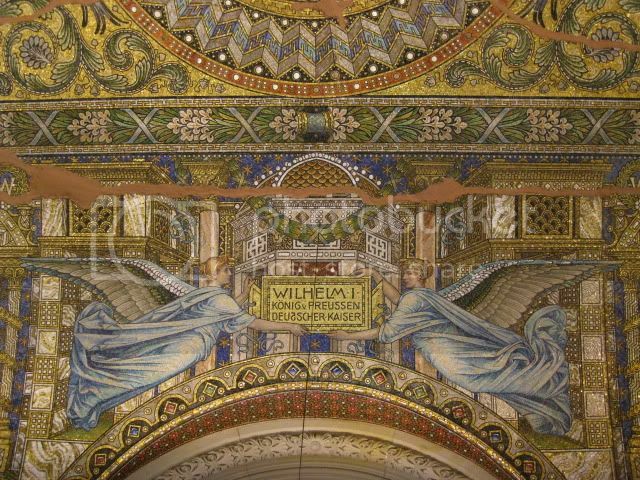 This is housed in a building across the street from Museum Berggruen. They must be part of the palace buildings as they are identical. But Collection Scharf-Gerstenberg also extends beyond the circular building into the next door former Royal stables. This entire building used to be the Egyptian Museum. 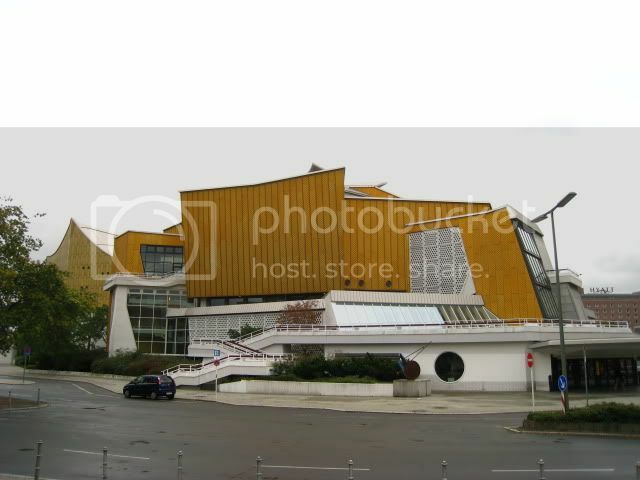 When I was in Berlin in 2003, this was where I saw Nefertiti. This surrealist collection is a quite disappointing, with few paintings by well-known artists. It only serves sandwiches, soups, and salads. Choices are limited but quite good. We also like the airy setting. We shared: brie sandwich, green salad with feta, tomato soup, and flaky pastry filled with spinach and cheese. Our lunch was 16 euro. I also like Giacometti and Paul Klee a lot. Basel and Zürich are *must* see places for you then.